The aim of this book is to make The Assembly of the Gods by Lucian of Samosata (c. 120 – 190 CE) accessible to intermediate students of Ancient Greek. The running vocabulary and grammatical commentary are meant to provide everything necessary to read each page, so that readers can progress through the text, improving their knowledge of Greek while enjoying one of the most entertaining authors of antiquity. This short dialogue presents Momus, the god of blame, arguing that numerous gods and their entourages should be expelled from heaven for being fraudulent immigrants. These figures range from gods and heroes with a human parent to various "eastern" deities, whose unhellenic appearance and behavior is objectionable. A number of famous mythological stories are referred to as evidence of the unsuitability of various gods and goddesses to their home on Olympus, but not without implying that the behavior of Zeus himself is often petty and hypocritical. 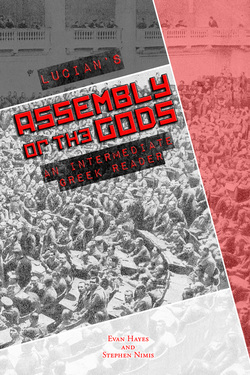 Lucian's The Assembly of the Gods is a great text for intermediate readers. It is breezy and fun to read with relatively simple sentence structure. The diatribe of Momus sounds some of Lucian's favorite satirical and literary themes. It delineates the pettiness of quarrels over status and the hypocrisy of the powerful. It also provides implicit and explicit criticism of the verisimilitude and logic of traditional accounts of the gods. The language of Athenian democratic institutions is invoked throughout, which also humorously humanizes the Olympian figures. Finally, imperial inscriptions suggest a more specific context and impetus for this satire.